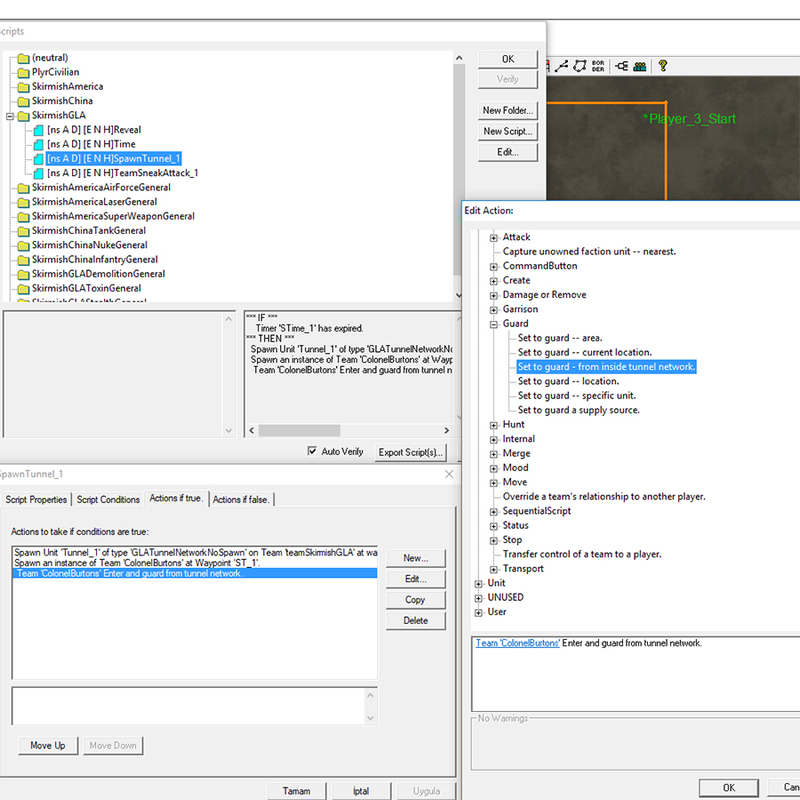 I would like to learn more about Tunnelnetwork with WorldBuilder for AOD maps. I^Love^Mixery has made some limited application of TunnelNetwork on AOD Maps. 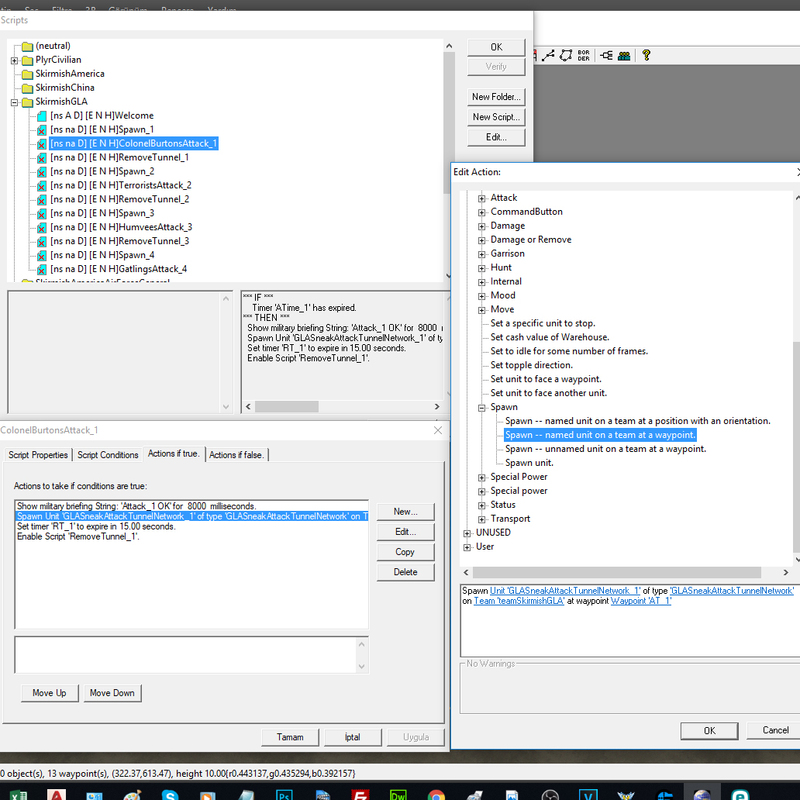 The concepts of GLATunnelNetworkNoSpawn, GLASneakTunnelNetwork and GLASneakTunnelNetworkStart are not clear for me. How, when, etc. we can use them on an AOD map. Would you please share your knowledge, experience, advices here if you have any. GLATunnelNetworkNoSpawn will not spawn tank hunters. GLASneakTunnelNetwork is the finished tunnel from Generals Ability. GLASneakTunnelNetworkStart is probably a cinematic version of the Generals Ability tunnel (with the deployment animation). Maybe it will turn into a usable tunnel, maybe it's just an animation. You need to test it. There is a script to set units/teams to hunt from inside tunnel network. So, set units/teams to hunt from inside tunnel network. Put those units/teams inside a tunnel network via script. 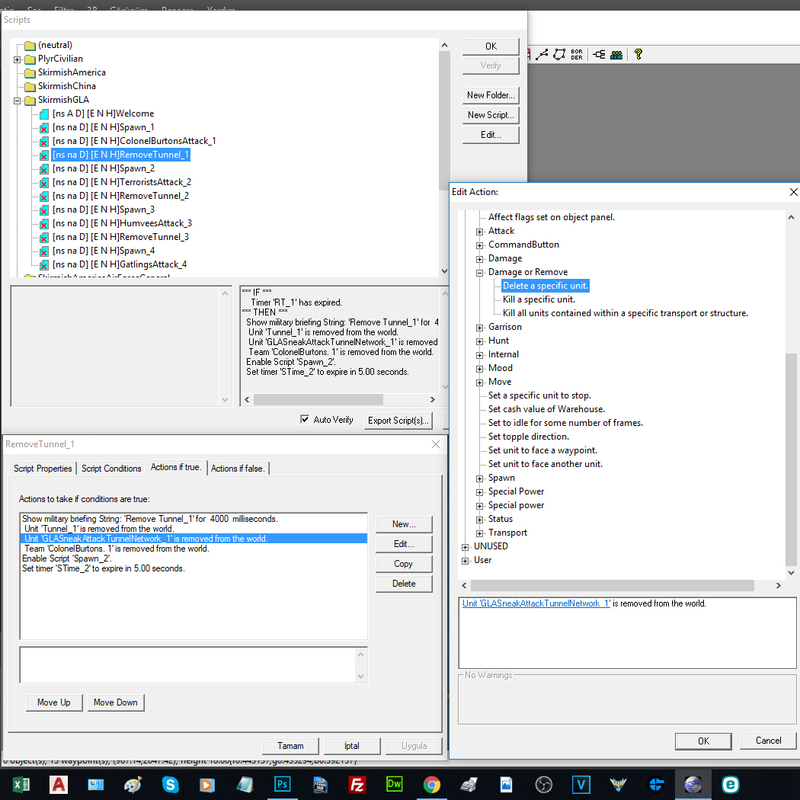 Make a script "Unit Use command button on waypoint"
Spawn a named GLA Command Center for the comp. Make the named GLA command Center use command ability "sneak attack" on waypoint "sneak attack" to make it create an ambush tunnel. Units will automatically leave the tunnel network and attack nearby enemies around the tunnel. If you want to manually make the units exit the tunnel and drive around, you will have to SPAWN a named tunnel instead of using the command ability, which will look a little less fancy (and won't trigger an automatic sneak warning sound). 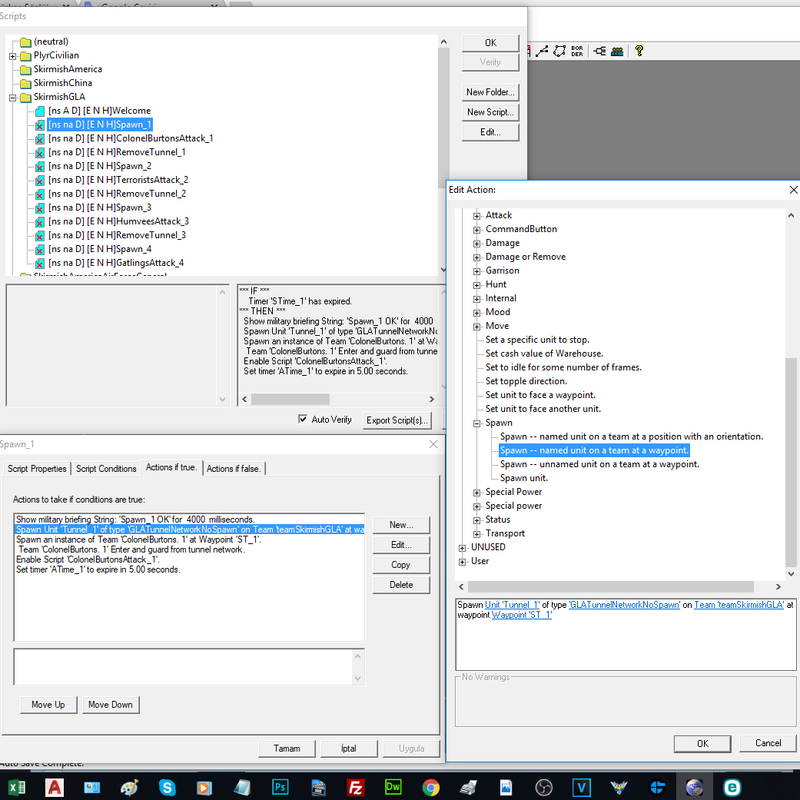 I don't have the Worldbuilder installed on my current machine, so I can't give you the exact script names/locations. Hopefully you will be able to find the scripts. sneak attack tunnel after the animation is done (5 seconds). So it won't work with any tunnel related scripts. Have the AI use the ability on the way-point. Then 5 seconds later spawn the named one on the waypoint. That way you'll have the animation from the ability, and be able to use the named tunnel in scripts. The only issue here is that there will be two tunnels in the same spot. Well , I should make 1 thing clear (Sorry for Bossy texting XD) , I have done most of the ways in a map so I know 5 Seconds is not VALID , There are lots of things a Player might do to Destroy a Tunnel . Now you may think of 5 Seconds and if Tunnel is alive But Players might even use EMP Machines to Disable the Tunnel and that way ... If it stays alive , 5 Seconds might be changed to 35 . So , When ever you Spawned "GLASneakTunnelNetworkStart" Setup an Script to test for "GLASneakTunnelNetwork" ; If Found , Your Script Sets up a Timer:1Sec and enables another Script which tests for both "GLASneakTunnelNetwork" and the Timer . WHY ? Because as You said , "GLASneakTunnelNetworkStart" will Spawn "GLASneakTunnelNetwork" when DIED , No matter Killed by another Player or Life-time Expiration , as Such If a Player has Destroyed It , "GLASneakTunnelNetwork" will be Spawned with lowest HP possible which will be destructed in less than a Second by a Single Unit . EA LA has used wrong logic on the Course and This is the Cause . This Problem can only be vanished by INI support which I myself am using but do not suggest other AOD makers to use INI as you know the Problems on Start and Restart Requirement . 1 user thanked Unknown Editor for this useful post. Last week I was away from my computer, so I could not make a workshop and share it with you. In the following workshop, I tried to explain how to create and turget a GLA_TunnelNetwork on a simple AOD Map. I used basic WorldBuilder scripts. You can see map and scripts on the following photos. You can also download the map and the replay from the following link and see scripts and watch the replay. How can we use TunnelNetwork to make sneak attack at the same time for 4 different players on a 4 players AOD map? Please download and edit AOD TunnelNetwork for 4 players v00.map and save as AOD TunnelNetwork for 4 players vXX.map, share here. We, The Noob Mapmakers, can understand better on map. 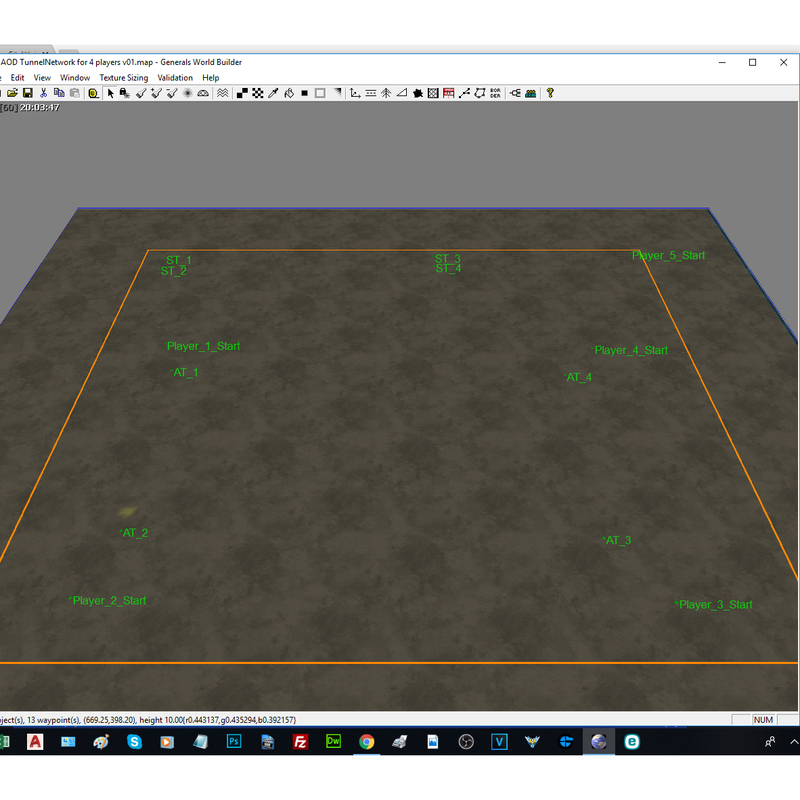 Create area around whole map(call it Battlefield or something) and use player0-7 scripting format for spawns for other players, scripts have to be in Civilian folder. player 0 is the host and set player1 to be AI and give waypoint 'Player_1_Start' to AI, all other players that join will be player2 etc. 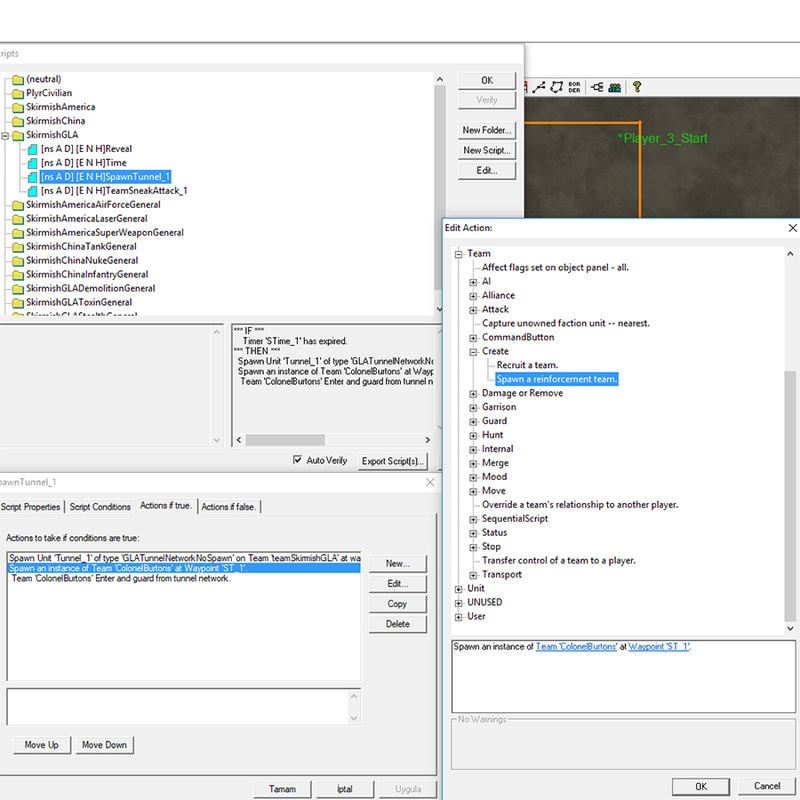 1- Spawn named or teamed objects on the AI and then transfer them to the player using the object's name or the object's team name. 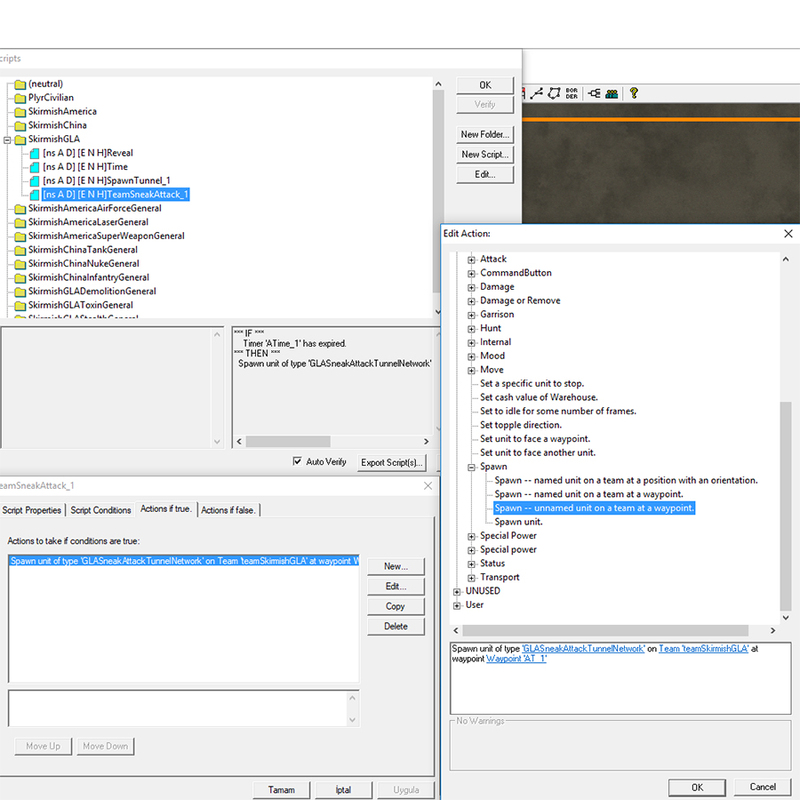 2- Create playerX players in the player list, place objects in world builder, and change the team in Object Properties to the playerX you want. 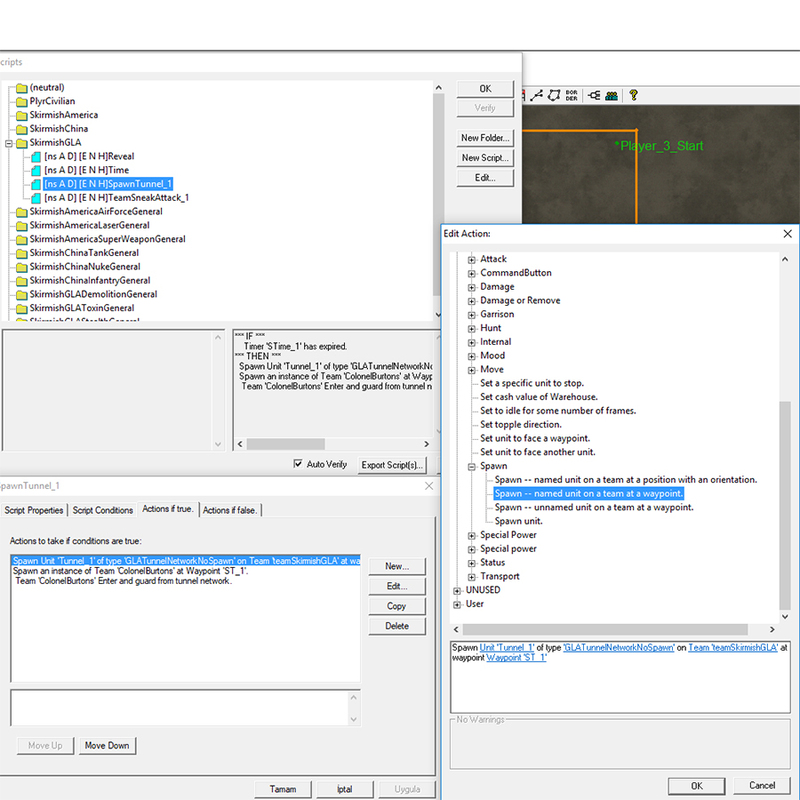 3- Place named objects in world builder and transfer them to the players using the object's name. I believe there are more ways but I can't remember correctly. Second part i never tested actually, so if you spawn a building on teamSkirmishAmerica at a waypoint for example it doesnt sell? so if you spawn a building on teamSkirmishAmerica at a waypoint for example it doesnt sell? If you need a building for humans, spawn it for AI and transfer it to the human player. If you need a building for AI, spawn it for AI, do not transfer it. My guess for the reason why AI sells buildings is, that this is the lazzy, hardcoded way the devs dealed with Black Lotus and other infantry who can capture buildings. It is also impossible to prevent this from happening. Even deactivating a building with a microwave tank, removing the "Sell" Command Button etc. will not prevent AI from selling a transfered building. a basic workshop map for you. Following map is an example of an AOD map with 4 players, 4 Different teams Sneak Attack through tunnelNetworks to 4 players separately. You can download and watch replay. You can move Tunnel Spawn points ST_1, ST_2 etc. to out of map border to make them invissible, scripts will work without problem. I could not make them to attack at same time. I don't want to remove previous tunnel before start new sneak attack. Nope, but don't spawn on waypoint, if I remember correctly, buildings that are spawned on waypoints do not have collision boxes, meaning units can go right through them, spawn them on a position using coordinates instead, this way you can also rotate the buildings if needed. TIP: To get the coordinates of a location hover your mouse to the location and on the left bottom corner x,y,z coordinates will show for the current mouse location on the map. 1 user thanked SkyMix_RMT for this useful post. TIP: To get the coordinates of a location hover your mouse to the location and on the left bottom corner x,y,z coordinates will show for the current mouse location on the map. if I remember correctly, buildings that are spawned on waypoints do not have collision boxes, meaning units can go right through them, spawn them on a position using coordinates instead. 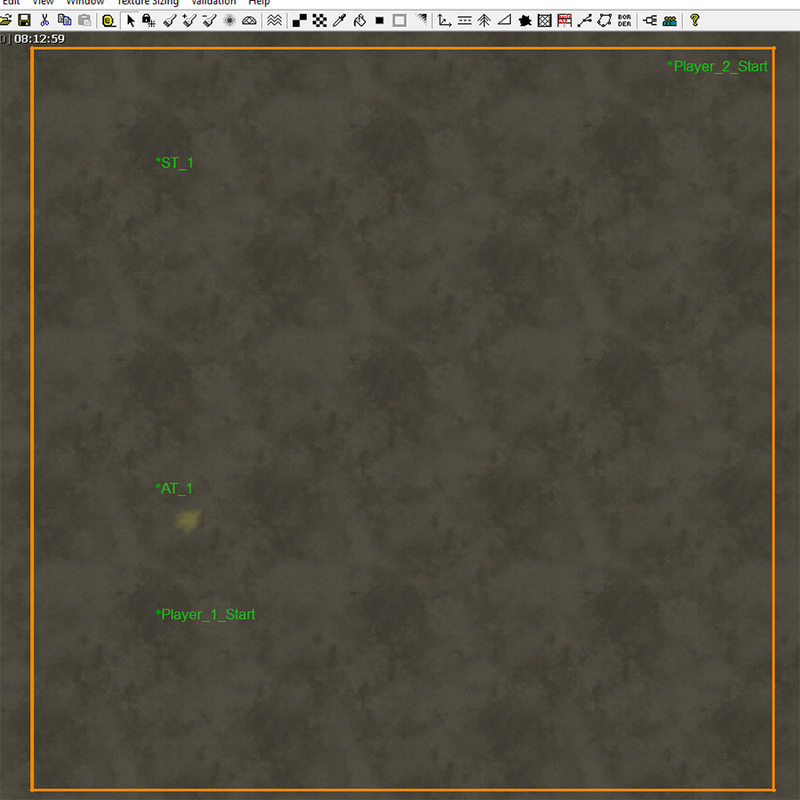 As far as I remember there is such a thing as "initial terrain height" when creating a map. Quite sure it's related. Unfortunately I don't have CNC installed on my current machine. Pasha, what script are you using to exit the units out of the tunnels? Do you use the hunt from inside tunnel network script? If so, there afaik is not much you can do about it. It's kinda random what tunnel the enemy uses in order to attack. But I think there was a script to index individual tunnel networks? I can check later this evening if you want, but finding the script for you is pretty much all I can do. Please look the pictures of scripts for a single NetworkTunnel. I removed the first NetworkTunnel from world and activated the second NetworkTunnel script and so on. This way you can make sneak attack from 4 different NetworkTunnel at different points and different teams. But all sneak attacks one by one, one sneak attack complete and second start. so on. I could not make them at same time. Please look the pictures of first attack and remove tunnel scripts for 4 NetworkTunnels. Don't worry too much, I just spent way, way too much time in the worldbuilder. Btw Pasha, this is as good as it's going to get. Here you can see how I evacuate a specific tunnel. It is not a pretty solution but it works. It is not really possible to move a specific team through a specific tunnel network. The tunnel index scripts that I meant earlier do not seem to work, I have tested it. Which means that you will have a hard time to send a different attack wave to each player. However you can empty the tunnels for each player randomly, which is what you can see in my solution. Have a look at my ugly solution (attached to this post). 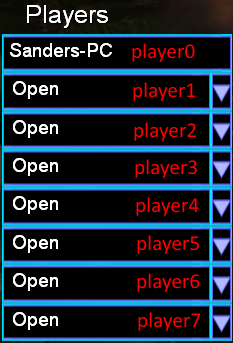 AOD TunnelNetwork for 4 players v02.zip (6kb) downloaded 10 time(s). I don't have zero hour right now, but I have an idea. What if we add 3 players in the player list, civilian faction (or else they won't exist), make them enemies of all human players, then spawn 4 teams, 4 tunnel networks, and 4 sneak attacks (3 of each are transferred to each civilian player), and then have scripts telling the civilian players to enter the tunnel and hunt from inside it? Well , this COULD work SkyMix_RMT but obviously it doesn't require to Spawn and Transfer . Even for players , I myself have just used [Spawn Unit of kind in Team "teamplayer0" ~ ~ ~ ]. Just Spawn the Units in civilian Players , And Do not try creating TEAMs in Civilian Players , Civilians are Not removed , Even color is what you identified in Player List but their Teams are totally removed and any attempting to spawn a Team or anything in a team can Cause Crash , Just Spawn in the Civilian Player Default team ; Example : Name=CivilGLA ==> Spawn Unit in Team "teamCivilGLA" . And by the way , I don't think different Players can use the same Tunnel Network Connection (I'm infact Sure about this) , you will require to make a Different tunnelnetwork for each Player . Also the easiest and most efficient way I have found to identify height to spawn a Building on , Is just to find the Center (Pointed with a Small Gray Circle) hold your Mouse Indicator on the Gray Point and Look at the Bottom of World Builder , You'll see X: Y: Z: and that you can actually take the height . Yea this will be the only way to have 4 individual base attacks with fully seperated tunnel systems. I am not sure what you have to do in order get the XP from killing these units (for generals promotions). This page was generated in 1.583 seconds.